Obverse: Radiate head of Helios right. Reverse: Rose in incurse square. History: The island of Rhodes was settled in 408 BC and a city by the same name was made its capital. Its location and climate together with the genius of its citizens for trade made Rhodes one of the greatest maritime powers of the ancient world. One of the Wonders of the Ancient World was built at Rhodes: the colossus, a 100ft high statue of the sun god Helios, patron of the island, stood in the harbor. 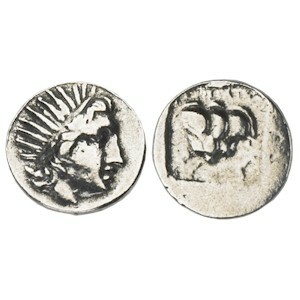 The face of Helios became a national symbol and appears on this Rhodian coin. The rose, also chosen as a symbol since the city had taken its name from the flower appears on the reverse.